I’m very glad to join you again at the 2018 Michigan-China Forum in the springtime. I’d like to take this opportunity to thank the Chinese Students and Scholars Association of the University of Michigan for the kind invitation and express my sincere gratitude to the organizers and staff for your hard work that makes this great event possible. At the first Michigan-China Forum last year, I had an in-depth discussion with scholars, entrepreneurs and students on topics such as transformation and upgrade of the manufacturing, innovation cooperation and youth exchanges between our two countries as well as the future development of China and the prospects of China-U.S. relations. Over the past year, there have been many major events taking place around the world. China and China-U.S. relations have also experienced important changes. What is the significance of these developments and changes? What are their important influences on China, the U.S. and the world as a whole? Today, I hope to have a review of these questions and share my thoughts with all of you. Last October, the 19th National Congress of the Communist Party of China was held in Beijing. The Congress emphasized that China’s development has entered a new era. According to the action plan and blueprint the Congress outlined, by 2020, China will fully realize the goal of building a moderately prosperous society. By 2035, China will basically realize socialist modernization. By 2050, we will build China into a great modern socialist country that is prosperous, strong, democratic, culturally advanced, harmonious, and beautiful. In order to meet growing needs of our people for a better life, China will continue to deepen reform across the board and unleash dynamism for development, guided by the new vision with more focus on innovation, coordination, green growth, openness and inclusiveness. As you know, China’s GDP registered a 6.9% growth and went beyond 12 trillion U.S. dollars last year, and we have set this year’s growth rate at around 6.5%. As we continue to maintain a strong economic growth, China will become a moderately developed country with a GDP of 43 trillion U.S. dollars by 2050, bringing happier, safer, and healthier lives to the Chinese people and unprecedented development opportunities to the U.S. and other countries. We fully recognize that China cannot achieve its goals in isolation from the world. China’s development needs a stable, peaceful and prosperous world. A stronger and more confident China will be able to make even greater contribution to the international community. China will continue to follow the path of peaceful development, implement a strategy of opening up and build a new model of international relations and a community of shared future for mankind. After decades of development, a large middle-income population, the biggest in the world, has emerged in China and given rise to a vast domestic market. This open market with a fast-growing middle-income population of 400 million will contribute significantly to global development and prosperity. China will actively promote the Belt and Road initiative, with the intention to build connectivity across the continents so that more countries will be able to participate in development and benefit from economic globalization. China will also hold the first International Import Expo in Shanghai this November so as to provide a new platform for expanding cooperation in China’s market among all parties and better share China’s development opportunities with the rest of the world. The two heads of state of China and the U.S. have had three meetings and numerous phone talks. The two leaders have both agreed that China and the U.S. share broad interests and important responsibilities for global peace, stability and prosperity. Our two countries are to carry out broad-based cooperation on the basis of mutual benefit, manage our differences on the basis of mutual respect, deepen mutual understanding and friendship between our people, and work together to address major regional and global challenges. We ought to work for the sustained, healthy and steady growth of our relations. Meanwhile, there are also some trends with current China-U.S. relations which draw our attention. The U.S. National Security Strategy Report released last December labels China as a rival of the U.S., which we do not agree. China is unswervingly committed to the path of peaceful development and steadfastly pursues a win-win strategy of opening-up. The ultimate goal of China’s development is to achieve national prosperity and enable the Chinese people to live a happy life. China always acts as a builder of world peace, a contributor to global development and an upholder of international order. What China seeks in the world is global partnership rather than expansion or hegemony, not to mention attempts to challenge or even replace the role of the U.S..
China and the U.S. are the largest developing country and developed country respectively. The development of our two countries is complementary and the success of both countries conforms to the common interests of both sides. The sound and stable development of China-U.S. relations conforms to not only the fundamental interests of our two peoples but also the common expectation of the international community. Cooperation is the only right choice, and only win-win cooperation can lead to a better future. It is quite natural for China and the U.S. to have competition, but we don't have to be rivals. Instead, we should strive to be partners. It is also regrettable that since last year, the U.S. administration has launched the 301 investigation against China and two days ago, US government declared to levy huge tariffs on Chinese imports following this investigation. Earlier this month, the U.S. Government declared that the U.S. would impose heavy tariffs on imported steel and aluminum, including those from China. There has always been a view in the U.S. which suggests that China is the winner and the U.S. is the loser in bilateral economic and trade relations. Such a view does not square with facts. Both China and U.S. have benefited a lot from our growing business ties. If China-U.S. economic cooperation only benefited China lopsidedly, I don't believe that China-U.S. economic relations could have gone this far over the years. It is normal for China and the U.S., the world's top two economies with highly intertwined interests, to have some differences and frictions in our economic cooperation. What matters is that we should address the differences through dialogue and consultation, expanding our common interests, so as to ensure the sound and steady development of bilateral economic relations. History has taught us that trade war is never the right solution. In a globalized world, it will only harm each and every party involved. As a vivid example of mutually-beneficial and win-win cooperation between our two countries, the nine Midwestern states in my consular district have been pushing forward their relations with China and achieved remarkable outcomes. We have four governors visiting China last year, and among them, Governor Snyder of Michigan paid his seventh visit to China. He met with Chinese Premier Li Keqiang and celebrated Michigan’s sister state-province relations with Guangdong and Sichuan respectively. 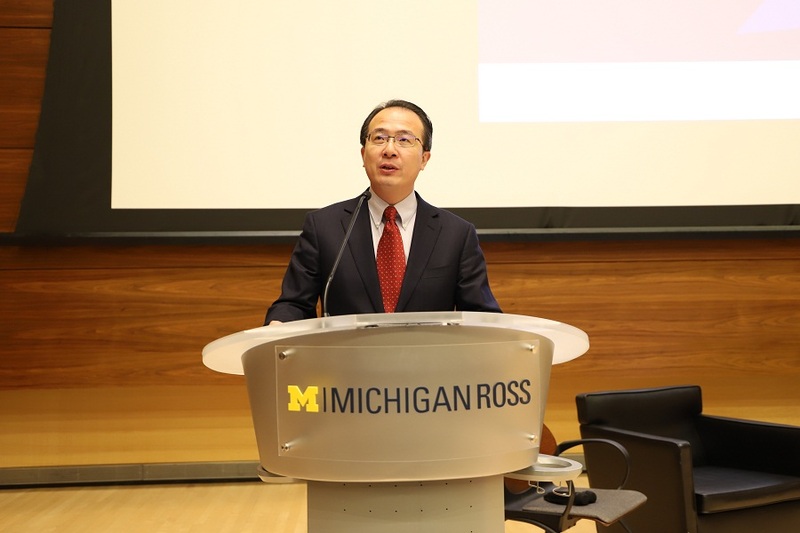 Under his vision and leadership, all-round exchanges and cooperation between Michigan and Chinese provinces and cities keep making new progress. China is the third largest trading partner and export market of Michigan. Last year, our trade volume reached 13 billion U.S. dollars and Michigan’s export to China increased 12%. China is a major market for Michigan companies such as General Motors, Ford and Chrysler. GM’s annual sales in China topped 4 million cars for the first time in 2017, accounting for more than 50% of its global sales. Meanwhile, Michigan has also become a major investment destination in the U.S. for Chinese companies, who have invested 4 billion U.S. dollars in this state. Speaking of China’s investment in the U.S. by state, the number of Chinese investment projects in Michigan ranks No.2, the number of jobs created by Chinese investments ranks No.3 and the total Chinese investments in Michigan ranks No.4. This May, Michigan will host an exciting program of “China Week” in Detroit, Ann Arbor and Grand Rapids. Michigan and Chinese partners will explore new opportunities of cooperation in intelligent and connected vehicles, medical devices, food processing, advanced manufacturing and other fields, which will hopefully inject new energy into our relationship. In China we have a saying, “A whole year’s plan starts with spring”. Spring is full of life and vitality. Spring symbolizes opportunities and possibilities. In this spring, we look forward to working hand in hand with friends in Michigan and the U.S. to tap the unlimited opportunities for exchanges and cooperation in various fields, bring into play the great potential of economic transformation and upgrade in our two countries, and jointly create a bright future for China-U.S. relations in the new era.